Informed consent has a major impact on regulatory compliance, enrollment rates and expenses across the life of your study. Yet the traditional paper-based process has transformed informed consent into one of the most cited deficiencies. 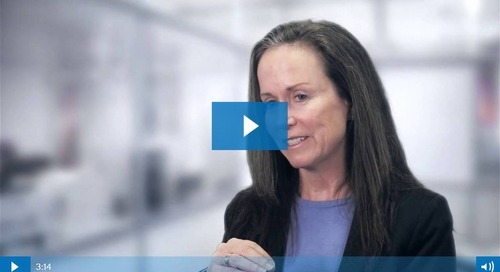 Regulatory agencies and the world’s leading biopharmaceutical companies have been pushing for a more effective informed consent process - and the technology has finally arrived. 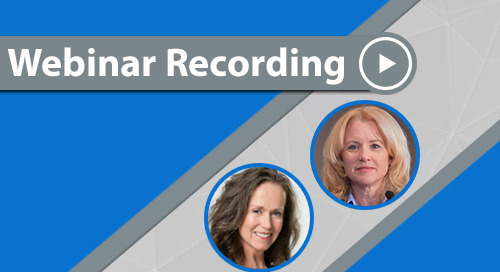 Watch this on-demand webinar to find out about groundbreaking new innovations in electronic informed consent (e-Consent), and learn how you can use e-Consent in your trials to increase participant compliance, retention and comprehension while reducing regulatory risk. Hello, and good morning or good afternoon to everyone that’s joined us on the call today. We appreciate your time. Thank you very much for joining us. 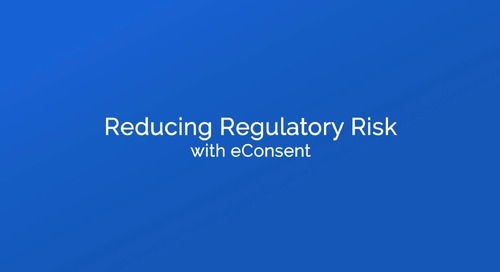 So today’s webinar is focused around Innovations in eConsent, electronic informed consent, and really around how do we reduce regulatory risk and improve participant comprehension with these new technological innovations. We at CRF Health are really excited because we’ve brought a special presenter, Sam Sather from Clinical Pathways, who has over 30 years of clinical experience, importantly, both at the site level and working as a consultant and educator. Joining Sam today is also Mika Lindroos who is a Director of Product Management at CRF Health, has a wide range of experience with product management in health sciences, and otherwise having worked Nokia and Digia Pic. And so without further ado, I want to jump right into it. And I will let Sam and Mika take you through the rest of the webinar. Sam? Great. Good afternoon, good morning everybody. And welcome to this presentation. We’re going to focus for the next hour on three main areas related to electronic informed consent. And the first will be related to some challenges with paper, but also some global support for a better consent process, you know, the global support out there. And then we’ll talk about the benefits of considering doing electronic consent to the benefits to all the stakeholders—for investigators, study participants of course, ethics committees, and sponsors. And then we’ll also talk throughout the time together for this hour about the opportunities to minimize risk, and related to risk not only in the regulatory area, but also in time management and meeting our deadlines and application needs. So first of all, I’d like to start off the presentation by having you do a polling. So go ahead and answer the poll. So what we’d like to do is have you let us know if you have used electronic informed consent in a clinical trial. So answer yes, no, not yet but I plan to, not sure. All right. I’m just going to close the poll. And we have quite a mix, which we were hoping for today. So the use, who have used electronic informed consent, we were expecting the majority on the call has not yet. But we’re also looking at different stakeholders too, so on the call I’m assuming we have some sponsors and CROs, sites, and IRBs. And we’ll talk a little bit about what we know of the experience level out there as well, using electronic types of systems for consenting. So we’ll start on a happy topic, the challenges of the paper consent. And many of you feel this every day in your work related to clinical trials. And on the screen is a quote from FDA from the 2015 draft guidance on use of electronic informed consent in clinical investigations. And to me it’s a teaching moment for the agency to remind us that it’s not just a signature on a form by the subject or the legal authorized representative. But it is much more than that. They talk about it being a process, and we really think about it as a process that’s informing and keeping the participant informed throughout their time on study, and also of course making a good voluntary decision to come on and to stay on the study as well. So we’ve had a big challenge in our industry for supporting this type of definition of informed consent with the paper process. So here’s another poll for you. So answer this, with true or false. 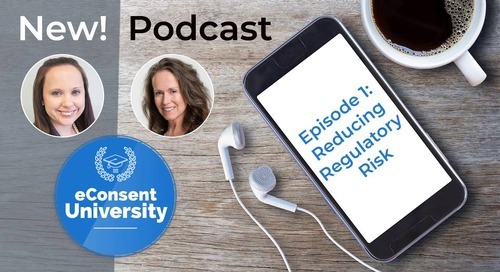 From what you know, informed consent is one of the most common regulatory deficiencies cited by FDA in recent inspections of clinical investigators. So true, false, not sure. So 82% say yes. And some say false. Now I know that worldwide, informed consent for being a deficiency related to the contents of it, the required elements, has gone less on the compliance screens. So definitely the process of consent—the development of it, the approval, the use of the right version, all these things—has definitely continued to be a very common citing. So what I’d like to show you is a message from the FDA that came out in March. So in March of 2016, FDA released their annual BIMO metrics, so the Bioresearch Monitoring Program, for inspection metrics. And this is pretty similar, definitely worldwide, and most common clinical investigator, CI deficiencies, you’ll see—this is in no particular order, but it’s the order they have it on their slide. But notice the last one: inadequate subject protection. And in particular, you’ll see what I’ve bolded and put in blue: informed consent issues. So it definitely remains one of the top deficiencies, which really can lead to all those other things that impact successful projects, like delays because of compliance issues, delays because of data integrity, etc. We know that the paper process is risky. And in some common deficiencies that we see—and again I audit, I monitor, I work with sites in global and US settings—and we still continue to see the wrong version has been signed or the consent is not attained before a study procedure that’s in your protocol. There’s also, if a subject is on study and they’re active and there’s a new version that’s been approved, the timeliness of that or even the proof of it sometimes, lost consent, lost paper consent. We’ve recently seen a warning letter because of falsified IRB approval stamps. So a lot of these things are part of the process. A few of them are about the written signed forms, like making sure that the right individuals who are required to be a part of the consent process—for example the investigator—that they actually are involved. The other thing, think about what we can’t prove. So if you think about the regulations, they require us to be able to reconstruct and evaluate what has occurred. So as stakeholders that are inspected, and at the research site level, they have to show that they adequately consented someone and gave them time for questions and really evaluated their capacity to actually consent. And in the paper world, we commonly don’t see that, and it doesn’t really support ALCOA very much, or the attributable-ness of the patients, the legibility of a lot of the documentation, the signatures, the timeliness, the contemporaneousness of it, the originality of it, and also the accuracy and completeness of it are big big things. So a lot of risk going into the paper process of consent. And as an industry, we definitely have struggled with this and tried to get better. At the site level, what we commonly see is maybe some tools or job aids, but these take away the actual experience of what really occurs. So sometimes there might be a pre-printed statement of how they did consent, not really supporting regulatory requirements. So these are the main categories that we feel that there’s opportunity to improve this current way we do consent and still meet regulatory requirements and better support our patients, better support sites for all that they have to do to support patients and do our studies, and multiple studies, and also support our projects’ really really aggressive timelines that we typically have. So the inefficiency, the laborious, complicated, content development. We call it the ping-pong match. And the project or the SOP level of content from the sponsor, adding the study level, and then hiring sites, adding the site level, and then also meeting globalization, translation, etc. So it can be quite quite risky because of the potential that that content didn’t meet all of those different ingredients that we serve. Definitely a lot of manual back and forth, a lot of difficulty to actually confirm that the version that is being released to the IRB to approve is what really is the sponsor’s okay, and what the site feels is what they need, etc. So again it’s that—there’s lots of replication of efforts. So ineffective-wise, we know that again, this deficiency of informed consent process support, regulatory-wise, has been an issue for three decades or longer. And we’ve only gotten longer in the consent. So we’ve made consents 50—I’ve seen 50 pages, recently, but probably the average is 15 to 20 pages. The flow of information. So my master’s is in adult learning theory or education. And we really don’t present this in a way that adults and/or whoever the population is—like children—can really comprehend. It is a lengthy, text-driven process. Or when you think about trying to absorb information, how much we actually really absorb. And poor comprehension. And we also wonder, are we missing that someone doesn’t have the capacity to actually consent. So we go into the risky column, next to this. The thing is, it’s risky thinking about, do we really know that someone is informed coming onto the study. And how can we actually be checking with that and documenting it actually to get proof that we did do our due diligence. The audit trail of being able to reconstruct it is very difficult. And then the inability to really have good control over version control, so when we update a version because of revisions, which commonly in most studies we do. Expensive. You know, when we put a dollar value on this, if it is a highly risky area and there’s a lot of rework—rework is a hundred times, at least, more expensive than when doing it right the first time. So if we’re not getting really good—the right patients, the most informed patients, and also supported patients during the trial, so the continuous consent kind of support can be much much more expensive for data especially as well. So there is global support for improving the consent process for sure. So these are just a few examples. Outside of some of our collaborative efforts that you’ll see on the screen, we definitely have support from regulatory authorities around the world to do things differently, better and, when possible, use the ability to do things more efficiently and leverage technology. So these two main initiatives you see on the screen, TransCelerate Biopharma have many work streams. And one of their most recent work streams is about eConsent. So we’re looking forward to the knowledge that comes from this. And again, what would be the standards or what would be some good recommendations coming out of this group, we’re looking forward to hearing. And then the Clinical Trial Transformation Initiative recently came out with a recommendation to consider changing how we flow the information out and how we actually train people to consent. But also the flow of information. So for example, the information in a typical consent is very laborious. So why don’t we tier the information or present it to them more like we would, trying to work with someone on an education level. So tiering the information they need at the time and where they are in the study can better help support them. There’s been actually new research coming out that’s kind of done through side-by-side comparison—so someone getting the laborious paper versus something that is more tiered—and we see some good results. So part of this global support is also initiating those, for example, arriving on the call to think about doing this differently. And it brings with it the worry or the risk that it will include more risk into our study. So it is an informed decision about can we do this differently. Obviously we are at a place in our industry where we have to do it differently because it’s just not working. So defining electronic informed consent. So let’s actually look at EICs—what FDA abbreviates it in their guidance document. What is the definition of electronic informed consent versus paper informed consent? So again, FDA did a nice job, and we see this globally, that presenting the idea that informed consent is not just a signature on a page. It is a process. It is preConsent, during consent, and it continues on. So take that into the electronic venue. So it’s still the same definition of informed consent. 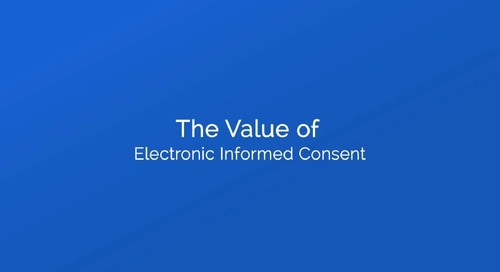 So think about when you consider going into and adding electronic informed consent into some of your things you offer in your studies or integrate it in, this means that it can be integrated into the development of it, the presentation of it, the obtaining signature of it, the supporting of patients throughout. That’s what we envision electronic informed consent really being and defined as. Not just being able to show somebody electronically what the paper would be, and sign off on it. So it’s bigger, the whole process. So FDA gives some examples of kind of multi-media. And again, regulators don’t recommend, or won’t lock us into a certain technology. Just meeting the requirements of the predicate rules of the requirements globally. So what we’ve talked about so far is the risk of where we are now, some of the pain points, the global support for doing something differently, and we’ve got new improved technology available that we’re using, and all sorts of other types of improvements for efficiency like eDiaries for example. So let’s now talk about even more, a little more specifically, about where and if electronic informed consent can help improve participant comprehension. And you know, I wanted to definitely integrate into this talk about the adult learning concept. And it’s something that we really have failed to support, related to our studies. And it’s all about, if you look at that centre blue circle, it is truly you could put there “patient centric.” It is really thinking about what does that patient need to voluntarily make this decision, the patient or their legal authorized representative, their parent, or whatever the scenario is. And so it’s really making sure that we support them and give them the information that’s understandable and what they need to know to make the decision. There is a need to have an orientation to what is the situation they’re coming into, so what does it mean to be a research subject can be kind of a foundation of their rights. Looking to see if they’re ready, actually, to make that commitment, so doing some assessment during the time of consent. Assessing that readiness. Making sure that there’s appropriate motivation of what the benefits versus the risk, and do they really understand that. And what is in it for me, so within the self concept, it is very important that it’s very clear to someone coming onto a study that they have all of these factors supported, not to manipulate them to come into the study, but to support them to be really informed to the spirit of why we do informed consent. So the interactivity of it is so important. It’s very hard to be interactive with a paper consent, not that human beings can’t be there, back and forth. But replaying that and supporting that that does occur, and that it does occur well, it is a challenge. And one of the initiatives coming out of CTTI is trying to support how we would present things better as well. So multi-media. We are a society that much more is used to seeing different graphics and audio and pictures. And think about our vulnerable populations, those that are blind or illiterate, different kinds of capacities to consent. How well is paper really supporting us? The other thing too is understanding, coming into a trial—and many of them are complex—what you have to understand to say, yes I’ll start the trial, is different than what you need to know as you move through the trial. So we’re learning more and more that if we give you everything up front, it’s very likely you’re overwhelmed, kind of losing the idea of what was it that I really needed to understand to be able to make the safe decision. And what is my commitment here. So this is really the foundation where we know as an industry is our gap. We have a big gap in the whole way we present it, and also getting the understanding and comprehension back. So can we also be supportive, can we use multimedia to help, we have it available these days. So one thing I wanted to show you also is, in asking that question before we went to the slide, the FDA and the guidance document from 2015—this is a quote from it—shows you there’s different areas where they are suggesting that electronic informed consent can benefit all the stakeholders related to how to perform, develop, and/or sign off on and then follow the information in the consent. So this has to do with many different components. 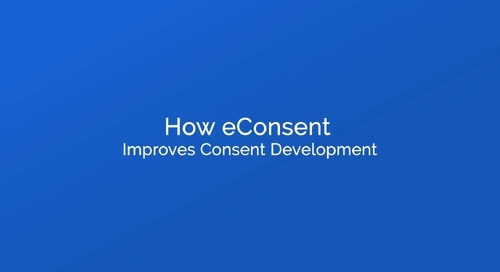 So electronic informed consent benefits can be related to the development of the consent. It can be also related to the comprehension of the informed consent for the participant. Then the interactive interface of the informed consent may facilitate the subject’s ability to retain and comprehend information, especially if they have access to it between site visits. Now the other thing is, we have—you probably know—we have experienced many times that the informed consent document gets revised during our studies quite often. And when it happens, it’s very important that this information get sent or provided to the research participants—so applicable ones, those that are still on study and those that are new—in a very speedy fashion. And some other things too is having a subject have to come into a research centre in those types of situations to be reConsented might also create a delay in their ability to get there, and also their willingness to stay on the study, for sure. So part of this promotion is definitely a better experience at site, but also a better experience or opportunity to do this remotely. So the next few slides take the key stakeholders, who are involved in some kind of part of the consent process. And within, what’s in it for me, why electronic informed consent. And I think of it two ways, too categories. On the lefthand side, these slides talk about the strategic benefits and why it might align with strategic initiatives. And on the righthand side is the clinical operation that’s running the study day to day. And depending on your job and your role on the call, if you are from the sponsors, what bucket do you sit in? You think about how this would be beneficial, and how you actually can benefit from it but also what is the process for integration, so thinking about that. Because one thing we know about using technology in the study—we learned this from electronic case report forms and electronic eDiaries—is that integration as early as possible is really key. So everybody has clear expectations. So strategic drivers. There’s lots of innovation right now with risk-based monitoring, and just technology innovation. So it fits right into this as well as integration and quality risk management throughout an organization and a clinical quality system. And on the operation side, the day to day, can I actually remotely monitor informed consent. Can I help my site better support the consent process. Can we actually know that there’s an issue early early early on. Can I actually keep track of how my consenting practice is going, how many people have consented, how many are still left to be maybe reConsented. So this whole management process. So maybe also there’s better collaboration between the sponsor and their vendors, like a central IRB and CRO. So CRO, same kind of setup here. Think about on the strategic side, there are quite a few sponsors that would think, hey I’m thinking about electronic consent, let me talk to my CRO. So a lot of times we look to the CRO to kind of think, ah, you know, are you doing this, is this part of your risk-based platform or the ability to remotely review stuff. And then operationally, on those same kind of benefits from the sponsor side. Then when it comes to the central IRB, or local IRB. Central IRB process is definitely to facilitate the ability to more efficiently get the consent developed and to make sure that we also can have better distribution of consent changes, as well as tracking. The IRB, being the overseer or human subject protection, being able to really have the ability of much more at-the-moment tracking of how the process is going. One thing that eConsent can do that paper cannot do, it can help us better create consent, it can help us better understand where is the place maybe in consenting the document or within even the study content that people are pausing, not understanding, or saying no to. And it very much can impact better creating your study. So because of the audit trail, the ability to actually reconstruct how someone went through the process, collecting—if the system can allow it—collecting the kind of questions the patient had during the time of consent, can really help the benefit of all these stakeholders. Same thing with sites. You know, definitely the message from sites related to adding innovation and technology onto studies is they want to make sure that they’re along for the ride, they’re a part of the decision making, and it’s not putting more burden on them. So the idea of making sure that this is presented and also how you pick your vendor and how you set it up, that they’re involved early on, there’s great training, and this process is simple, but it’s not more laborious, but it’s something that is supporting the research coordinator, the investigator side, related to their documentation, but also their operations. So there are research centres that do, of course, a lot of their own research.—big academia centres for example—that are also on the lefthand side here looking for innovation related to technology for the studies that aren’t working with industry sponsors. So it is also why eConsent also falls within sites for many many different ways inside. So the last part I’m going to talk to you, and Mika’s going to take over, I’m going to talk about the whole minimizing regulatory risk. And as I’m moving through this section, remember to think about some of the questions you might have at the end of the presentation. Because we’ve touched on probably some hot topics. So here’s another polling. It’s our last polling except for the very end. We’ve got one last one for you. But informed consent can contribute to regulatory risk. So strongly agree, I agree, neutral, disagree, strongly disagree or not applicable. And it’s almost like I’ve been selling you on that the whole time for the last 30 minutes but a lot of you, it’s actually—you’ve seen it, you’ve seen the results of not having the consent in place and someone’s monitored the study and the data we can’t keep in our database, that kind of stuff. So let’s look at the results. And strongly agree, we’ve got agree. So you know, we’ve got some pretty strong feelings. And right now, we are an industry that’s looking to really do more risk management, risk assessment, so risk-based monitoring. So I guarantee one of your categories for your studies and your sites is consenting, and what could go wrong. And if it went wrong, how bad would it be, how likely is it to happen, what are some mitigation strategies. So part of your mitigation could be using different types of approaches to consenting. The other thing to think about risk related to informed consent, period, is it’s not just related to obtaining consent, etc. If you think about if we take onto our studies poorly informed participants, it affects our data. It affects the retention of people wanting to stay on the study because they're not informed of what they’re getting involved in. So how we are performing the consent process is so important to do different. So if we can use electronic informed consent to be able to better time out things, you know, digital timestamps, how long did the patient spend on—so clear audit trails. The timestamp also, when did consent actually occur, not just the time that someone wrote down, because this is something not in control of the person that’s at the site. Did we actually get it at the time that was reasonable enough to be able to reconstruct that it was before study procedures. So very very interesting to a lot of stakeholders that that occurs. Same thing with digital time contemporaneous information about getting a new consent in place. Version control. You know, in electronic informed consent the system should be able to make it so that it isn’t possible to use the wrong version. Remote monitoring. Based on how a sponsor sets up their policies and procedures, and their risk-based monitoring systems, being able to support that. One of the main things we can’t do in risk-based monitoring remotely is the informed consent review. Some sites maybe are redacting it and sending it by email attachment, which is much riskier. So can we actually promote a truly monitoring experience. So real time information about, okay how many people do we have left to get reConsented, we’ve got this really critical update. So these are things that with integrating in the right experience, the right technology can really again support and minimize risk. So it’s part of your mitigation strategy. I’m going to pause here, and Mika is going to take over with streamlining development and the rest of the presentation. Thank you Sam. So that has been very informative. And what we learned so far is how eConsent can help improve the participant experience and how it can reduce risks, and how it can benefit all the stakeholders in the process. And of course, there’s a question that how does one create eConsent. And one could think that it actually sounds like a quite difficult process. But actually it’s vice versa. Because when we do get rid of the paper process, we can take into use the modern technologies, the IT platforms, the content and document management systems, and the process engines, and with those we can actually streamline the process so that it’s much much faster but it’s also much more controlled. And that helps in saving time in creating the consent, but then also making sure that the approval happens at the right time, and that only the approved documents are available on site for performing the informed consent. And also if we create new versions then the old versions are not anymore in use and only the newest versions can be utilized. So all of that contributes to the streamlining of the constant development. And when we invite all the stakeholders and provide them these tools, then they can make informed consent happen much much faster, they can make it standardized and make sure that the participants actually have really the most up-to-date information available. The benefits of electronic informed consent does not stop there. So actually it is also reducing cost. And one could think why something electronic is cheaper than paper. There actually are a few things that contribute to the long term savings of the clinical trial when you’re using an electronic informed consent. On the top you can see improved patient recruitment, so when we talk about—Sam was talking about adult learning—using multi-media, interactive content, knowledge information delivery and so forth. All of that is actually contributing to the improved patient learning and then therefore also improved patient recruitment and retention. And these again then contribute to faster completion of clinical trials. Then on the other hand, when we store everything electronically—the signatures, the consent documents, the versions, and the supporting material—it’s all available remotely. So there’s no need to travel on site and study the consent documents, but you can inspect them remotely and you can also do that in real time. And then, like Sam talked about, the regulatory risks. When we are able to control the versions, the time stamps and the approvals, we are mitigating the risks and mitigation-related expenses. 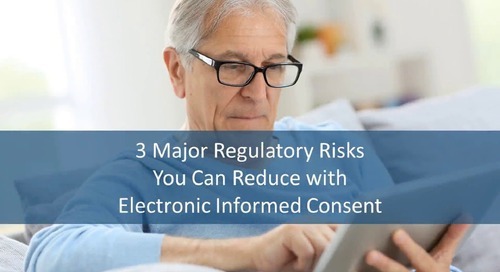 So these three things together, they all contribute to saving cost when using electronic informed consent. 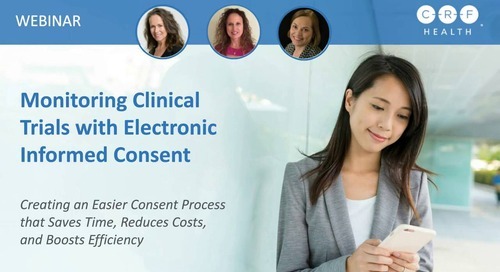 And we are approaching the end of this session, I will quickly talk to you about how CRF Health is approaching electronic informed consent with our consent solution. So as you know, CRF Health is the market leader in the eCOA. We created a global eCOA platform that is robust, scalable, and secure. And extending that platform with electronic informed consent feels much more than natural. And in designing our solution, we have—let’s say we practice what we preach—so we are very much a participant into the centre of the development and ensuring that they are engaged and they are safe and also thinking about interests of all the other stakeholders. 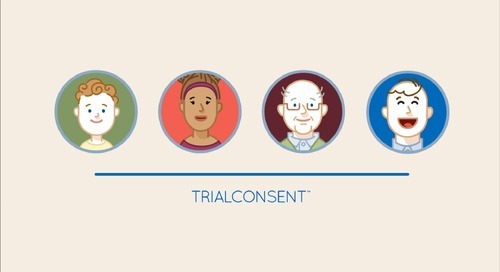 Our single platform that supports eCOA and informed consent consists of these four components, starting from capabilities of designing both the informed consent and the eCOA, then of course executing them. And then having tools to manage both informed consent and eCOA in real time. What is then so specific about the trial consent solution? So it’s truly integrated on top of our eCOA platform. We provide that experience on top of our eCOA tablet devices. Of course it’s available also as a stand-alone service. We provide the designing tools for creating the eConsent experience and taking into account the editing process of all the stakeholders. 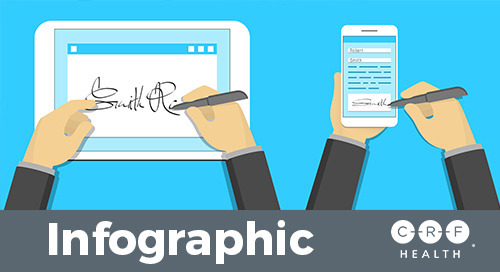 Providing reporting, and then of course fulfilling the signing requirements, both for the digital and then of course paper versions as well. So that actually takes us to the last slide of this session. And these are the key takeaways from this session. So you learned that there’s a clear chain in the clinical trials industry moving from paper to electronic in the eConsent. And if you’re wondering if you’re alone, but you’re not alone. 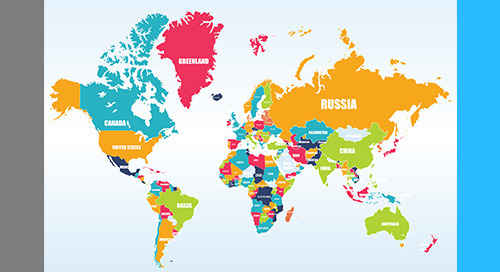 There’s actually a lot of global support there. Initiatives like TransCelerate and CTTI and other activities that are supporting that change. You also learned that there are certain risks with the paper process. A lot of risk. I think when we did the poll, a lot of you agreed that there’s a lot of risk there. 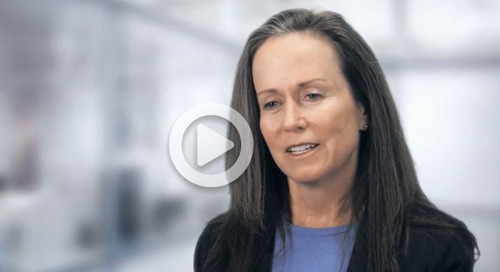 Sanctions, regulatory fines, litigation, and even trial failure. And then in the end we have talked about the electronic informed consent and the benefits it brings. So in the core, there is the participant comprehension, improving that one, and that leading to the improvement and retention rates. And on the other hand, we discussed all the different benefits of the stakeholders, so not just the sponsor, but also the CROs, the sites, and ethical committees. We discussed about streamlining the consent development, making sure that we have the approvals, we have time stamps, we have the correct versions available. And then also how actually eConsent is limiting the cost compared to paper. 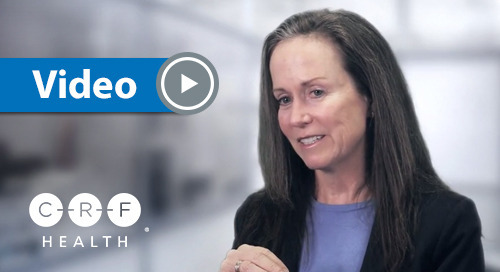 Deciding to participate in a clinical trial is not risk-free for anyone. 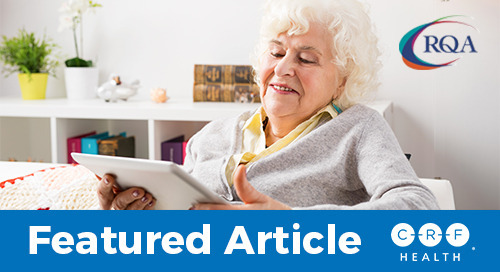 This article explores how to best support patients during the informed consent process (ICP) with eConsent.